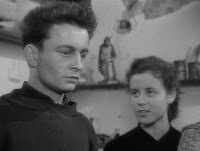 With his third feature film, Diary of a Country Priest (Journal d'un Curé de Campagne, 1950), Robert Bresson’s filmmaking reached its distinctive style of cinematic expression. In some ways, in fact, this could be said to be the quintessential Bressonian film, and if there were to be only one film of his that you could see in your lifetime, this should be the one. The film is based on a celebrated novel by Georges Bernanos, which had received th e Grand Prix du Roman de L'Académie Française in 1936. Bresson’s film also won a number of international awards, including the Grand Prize at the Vince Film Festival and the prestigious Prix Louis Delluc. The story recounts the experiences of a young French priest who has been assigned to his first parish, in the small, far-north French town of Ambricourt. What makes the film appealing to many people is the sincere and thoughtful way in which the deep questions about life and death are grounded here in the struggles of the youthful priest to come to terms with them. He is, after all, supposed to be a man who has the ultimate answers for his parishioners, but he, himself, is filled with his own doubts and insecurities. And to his great consternation, the priest seems to be ineffectual in all his attempts to help people and guide them towards salvation. Because of Bresson’s spare style of cinematic expression, which draws the viewer into a reflective mode, one’s reactions to the film can vary with each viewing experience. This is almost a paradox; because at first thought, one might think that Bresson’s cinematic restrictions, which cut down complexity from the image, would have such a narrow focus that subsequent viewings would be unbearably repetitious. But in fact it’s quite the opposite: since one is engaged with the film on a more interior and reflective level, each reviewing of the film is accompanied by the viewer’s mental background and context on that occasion. And that background context can be quite variable over time and across the breadth of the viewing population. As a consequence, many people have quite different reactions to Diary of a Country Priest. Some people see it as pessimistic, for example, while others see it as optimistic. The story is explicitly represented as a diary, and throughout the film there are close-up shots of a hand making entries in the diary. This is a constant reminder that we are essentially witnessing the dramatic reconstructions of events experienced by the priest, along with his running account of his own reactions to them. The main scenes all have fade-ins and fade-outs, which gives them a certain standalone integrity that can be characteristic of journal entries. The principal narrative revolves around the priest’s extended encounters with three different women in the village. Each encounter ends ambivalently, although a certain kind of progress has been made. 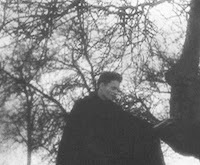 When the film starts, the priest is shown cycling into the village and past the manor of the local count, behind the gate of which an older man can be seen embracing a young woman. We later learn that this is the married Count and his governess, Louise. Soon there are a few things clear about the priest's situation in Ambricourt. The people there are frequently niggardly, petty, and sometimes malicious. This is not a devout parish that cherishes its priest. The priest, himself, is enfeebled by a serious intestinal illness. He is also quite isolated. There are a few educated people among his associates, but they all have their own characteristics that separate them from the young priest. There is the older priest of the nearby Torcy parish, but this fleshy, down-to-earth, pragmatic realist is psychologically quite apart from the earnest and idealistic young priest of Ambricourt. There is the Count, who is superficially friendly, but he wishes to keep his probably indiscreet family affairs private, and so remains aloof. There is the atheist doctor, Delbende, who has fallen behind modern medical practice and has lost his patients. He has no ideals left and counsels the young priest simply to face reality, muddle through, and do the best you can. Soon, however, Delbende's hopelessness gets the better of him, and he kills himself with his gun. One key encounter is with a young girl in the priest’s Bible classes, Seraphita. She gives the appearance of being a sincere and enthusiastic student, and she fires up his hopes of being able to encourage a sincere Christian along a righteous path. But her sincerity turns out to be only a pose and is intended to play on the priest’s naivete. She and her friends mock the priest for being a fool. A second encounter is with the Count’s teenage daughter, Chantal. She rejects both her father for his adultery and her mother for her passive willingness to ignore it, and she is now completely rebellious. In several encounters with the priest in the film, she reveals how self-centred and malicious she has become: she is ready to defy God and commit sin for sin’s sake. The priest fears that she is suicidal and goes to speak to the Countess about her. This signals the third and principal encounter in the film. In most of Bresson’s films, key narrative actions, particularly the violent ones, are not shown on camera, but are merely referred to. In other cases, what may seem to be significant activities are just off screen. 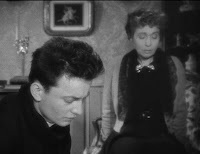 This is characteristic of Bresson’s elliptical style of storytelling. For example, Delbende’s suicide is only discussed, after the fact. So, too, the later death of the Countess is not shown, but only discussed. But the key thematic theological encountersbetween the priest and the Countess is played out in full before the camera. We learn from this encounter that the Countess has long mourned the death of her young son. This tragedy has dwarfed all other indignities of this world, and she has mentally retired from any further combats. She only wants to dwell on the past and what her b oy meant to her. The priest commands her to yield to God, unconditionally, and not to retain her proud feelings. But the Countess will have none of this priestly talk and reveals a subtlety of thought that far outstrips the priest’s arguments. She tells him that her fondness for her son is all that she has left. By “surrendering” everything to God, she would simply be faced with nothingness and death before her. The priest defensively remains steadfast in his commands, probably not out of confidence, but simply because he has nothing else to offer. In a striking moment, perhaps an epiphany for the Countess, she finally breaks down and yields. This is the high point of the film. The next day the priest receives a letter from the Countess, in which she describes how his innocent pleas had enabled her to return to life. She is now at peace. In voice-over, the priest reflects on the fact that the peace and certitude that he apparently “gave” to the Countess was not something that he, himself, had. He had been an unknowing vehicle for God’s salvation. The priest’s debilitating illness becomes worse, and he faints while out walking one evening. Seraphita finds him and looks after him, helping him to recover slightly. He wonders at her kindness, but she confesses that she has been telling many malicious lies about him in the village. She does not own up to being a good girl. He has now reached her somewhat, not through his teaching, but simply by revealing to herself her basic compassionate instincts. The priest intends to go to Lille to see a doctor, and Chantal comes to see him. She, too, is somewhat fascinated with the priest’s goodness, but she is also proudly impenitent and cannot admit to any remorse. They depart with their differences unresolved. On the way to Lille, the priest gets a motorcycle ride from Chantal’s cousin, Olivier, a bold and worldly young man from the French Foreign Legion. Sitting on the back of the speeding motorcycle, the priest smiles gleefully and comes to appreciate for the first time the thrill that young people have for risk-taking. Upon arrival in Lille, they talk briefly. Olivier comments how his fellow soldiers reject both ordinary society’s petty rules, and God’s complicated sense of justice. The priest responds that the world of ordinary people lacks love, and the reflective Olivier concedes that the priest’s view is wiser than that of his fellow soldiers. At the doctor’s office in Lille, the priest gets the crushing news that he has incurable stomach cancer (again, this verdict is only discussed after the fact -- the doctor is not shown). He reflects on his own impending death and how he still doesn’t understand the meaning of anything. He visits a former seminary classmate who is now a drug salesman. The friend, who is also extremely ill from consumption, is only interested in his life as an intellectual and neglects the selfless love of his mistress. The priest, now very weak and near death, is alarmed to see his friend, also probably to die soon, so misguided. He urges him to go to his colleague in Torcy and seek repentance. That last line, with only an image of the Cross on screen, is crucial to our appreciation of the film. Throughout the film, the priest has expressed to himself, in his diary, all his doubts about religion and his awareness of how ineffectual he has been to help his parishioners. And yet, we feel that the Countess, Chantal, and Seraphita have all been marked, and for the better, by their interactions with the priest. But there are no clear-cut answers given – only the Sufic wonder that there is something beyond.